Xiaomi has confirmed plans to bring a foldable smartphone to market soon. The all-new handset will have two folds, unfurling like a set of French doors, rather than the book-like fold of the rival Samsung Galaxy X. The latter is tipped to launch on February 20, 2019 during the Galaxy Unpacked event that will also see the announcement of the Samsung Galaxy S10 – and maybe even some smart shoes. Given that Galaxy Unpacked is next week, Samsung is highly likely to beat Xiaomi and other folding rivals to market. But while it may win the battle, the war is yet to be won – and Xiaomi looks to be working on something truly special for its pliable champion. 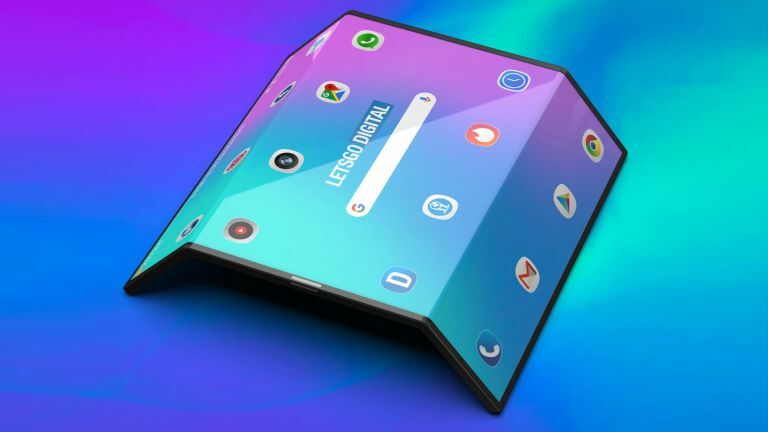 Technology blog LetsGoDigital has mocked-up some high-resolution renders of the final design of the foldable smartphone, based on the short video of a working prototype released by the company and an internal report from Korean research agency CGS-CIMB Research that referenced the design of the device. Like the Royole Flexpai, Xiaomi looks set to fold its display outwardly. Based on the renders, the the display will tuck behind itself to reduce the amount of available screen real estate and make the device easier to use one-handed. This is the exact opposite approach to the Galaxy X, which folds inwardly, like the inside pages of a paperback, and requires a secondary so-called Cover Display that's still accessible when both halves of the flexible screen are folded-in on themselves. Another key differentiator between the approach taken by Royole and Samsung, and the design unveiled by Xiaomi is the dual-folds on the latter. Xiaomi has confirmed that these can be folded away and unfolded independently from one another, so that smartphone owners can gradually increase the display size. Xiaomi says that it has updated its Android-based OS, known as MIUI, to contend with these dual-folds. As such, the smartphone is able to run in double folded, single folded, and tablet modes – with the user interface and apps adapting to the available screen real estate. Since third-party Android apps are designed to run on a multitude of different screen sizes anyway, there shouldn't be any problem with these expanding and contracting as smartphone owners fold down corners of their device. The advantage of these folding screens is allowing smartphone owners to increase the amount of screen real estate on a whim. While larger phablet-sized devices have become increasingly popular amongst consumers, the mammoth displays can be cumbersome to use – especially one-handed. In a statement confirming its plans to launch a foldable smartphone, Xiaomi Global PR told LetsGoDigital: "The double folding smartphone is the latest innovation by Xiaomi. One of the key components of the phone, the flexible folding screen, is co-developed by Xiaomi and its supply chain partner. Aside from the screen, its design, folding mechanism and MIUI adaptation are developed by us. "Xiaomi is first in the world to present a double folding smartphone and has the same technical challenges posed in its three different form factors – double folded, single folded, and tablet form. Prior to finding the best solution, Xiaomi has conducted extensive research into the development of a robust folding mechanism. "Each innovation is the result of joint, cumulative R&D efforts from supply chain partners and the device manufacturer. It is misguided to think a folding screen can be easily turned into a folding smartphone without significant breakthroughs in technology. Each segment of the industrial chain has its unique contribution. "Xiaomi believes that innovative products and great user experience are possible with sound collaboration and participation from all parties." Being able to unfurl the full display before watching a film, but folding it away when texting on the move could solve this problem once and for all, manufacturers hope. Google has already pledged its Android mobile operating system will be updated to support folding smartphones and tablets – devices it brands "foldables" – most likely with the arrival of Android 10.0 later this year. For now, the company has mainly issued guidance for developers for best-practice to future-proof their apps and take advantage of existing features built into Android.